Ballymena Road Club have prime dates for their two big open race promotions in 2015. First up is the Wallace Caldwell memorial road race which is scheduled for Saturday 21st March 2015. Next year’s Caldwell comes bang in the middle of a clutch of other prestigious Ulster events. It comes on the fifth weekend’s racing of the new season and sees the Caldwell fit in nicely one week after the Tour of Ards which is on 14th March. The Carn wheelers classic (Maghera) is scheduled to be held the day after the Caldwell, with the Cicli Sport GP (Moneymore) on 28th March. The Red Hand Trophy, which was held in March last season, has a later date in 2015 with 30th May being allocated to the event. This is one week before the very popular Donegal Ras three day event. The second annual Billy Kerr sportive is scheduled for 15th August 2015. This year’s event will be based at Eaton Park rugby ground on the Broughshane road. It follows on from the success of the inaugural event last summer, perpetuating the memory of one of Ballymena’s greatest ever sportsmen. Last year’s event saw a remarkable turnout of 271 cyclists taking part, not only locally but with some having travelled from England and Scotland to be involved. 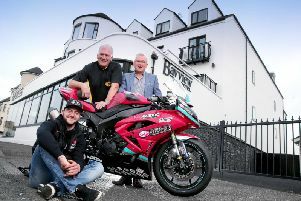 They were treated to spectacular views of Northern Ireland’s famous north coast and while everyone had an enjoyable day, the real success story came in the fact that the event helped raise a brilliant total of £4,575 for the Northern Ireland Children’s Hospice. This was the club’s first attempt at staging a sportive, in its 60 year’s history, and it certainly was impressive. It was widely accepted by those taking part that the organisers got it just right. Existing Ballymena Road Club members should note that their Cycling Ireland memberships, insurance and race licences expire on 31st December. Existing members may renew their licences etc. on line at the CI web site. They should note, however, that their applications will only be approved once they have paid their £15 Ballymena Road Club membership fee. This club fee can now also be paid at the same time as applying for your Cycling Ireland membership. It is planned to have some touring rides during the festive season with small groups hoping to go out on Boxing Day – Friday 26th December as well as Saturday 27th and Sunday 28th. If the weather conditions are favourable there may also be club rides throughout the week commencing 29th December and of course on New Year’s Day – Thursday 1st January.